Buyer and Seller Home Inspections consist of a thorough visual evaluation of the home and its systems to determine their condition at the time of inspection. 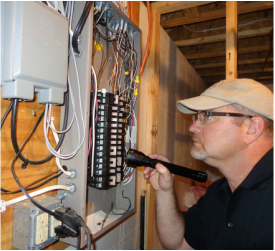 Included with your home inspection is a comprehensive and professional report that conveys our findings in an easy to understand format, delivered to you in a timely manner. During your inspection (if you so choose), we will take potable water samples in a manner that follows strict mandated protocols and promptly deliver them to a Minnesota Department of Health Certified Environmental Laboratory for chemical analysis. Surety Home Inspections offers short term radon tests that can be used to determine if radon remediation measures need to be taken. Radon is an invisible, odorless gas that comes from the natural decay of Uranium found in soils throughout the country. Recent studies conducted by the Environmental Protection Agency have concluded that radon is the second leading cause of lung cancer, and the number one cause of lung cancer among non-smokers. Radon gas can be found in any home at various concentrations but can be easily removed if the levels are determined to be too high.